The hip is a complex ball-and-socket joint comprising the acetabulum, proximal femur, and articular cartilage. In addition, the capsulo labral tissues and surrounding muscles and tendons stabilize the hip, dictate its range of motion, and enhance its function. 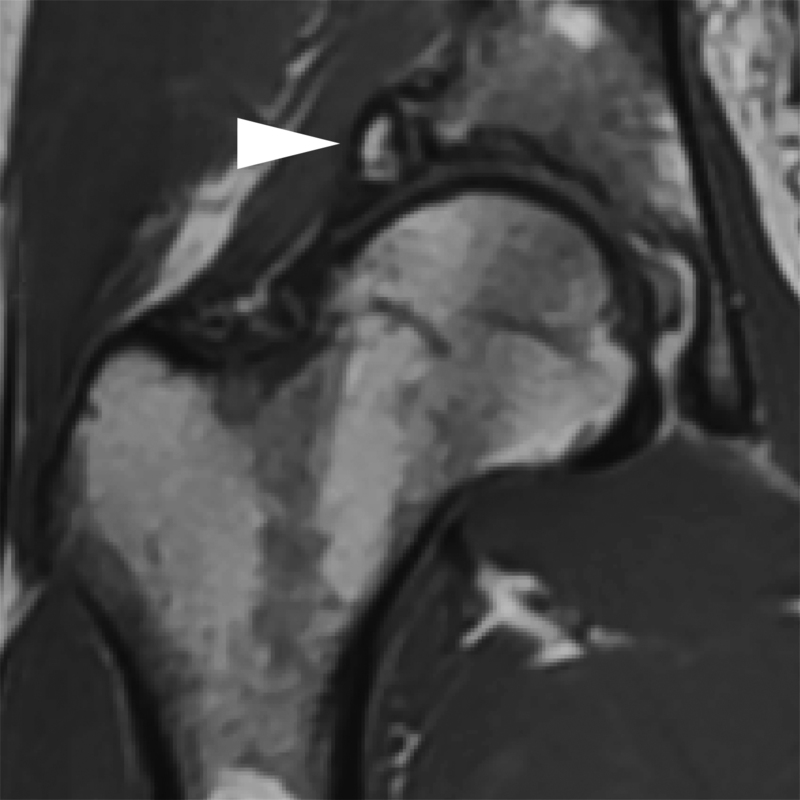 Familiarity with the spectrum of magnetic resonance imaging (MRI) appearances of the hip is necessary to recognize normal variants and distinguish them from true pathologic conditions. This article provides a brief overview of considerations in tailoring protocols of the bony pelvis and hip to optimize detection of both intra- and extra-articular hip pathology, followed by a review of common labral, osteocartilaginous, and soft tissue variants that can be mistaken for true pathology. Dedicated MRI protocols for imaging the pelvis and hip vary among institutions, but there are key elements common to most. In patients with nonspecific hip pain, even unilateral symptoms, large field-of-view (FOV) images of the pelvis (30 cm or more) are commonly performed, spanning the region from the iliac crests to the level of the lesser trochanters. This prevents other pelvis pathology that can mimic hip pain from being overlooked. Coronal T1-weighted images without fat suppression are best for revealing detailed anatomy and evaluating bone marrow and musculature. Large FOV fluid-sensitive sequences, either T2-weighted with fat suppression or short tau inversion recovery (STIR), are obtained in the coronal and axial planes and are used to evaluate for fractures, fluid collections, and injuries involving tendon or muscle. Larger slice thicknesses (5-7 mm) with small interslice gaps can be permitted for these large FOV images. For pelvic imaging, depending on patient body size, either a torso phased array coil or a larger body coil can be used. 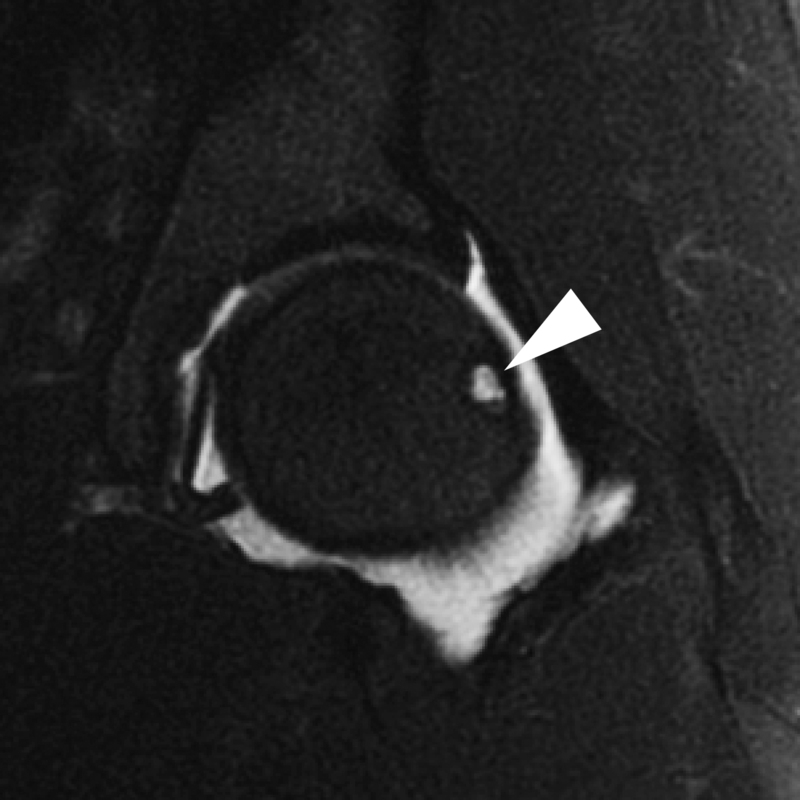 Depending on the referring clinician, dedicated imaging of the symptomatic hip may be performed only based on the clinical examination and clinical question. The labrum is a fibrocartilaginous structure attached to the peripheral acetabulum. It facilitates appropriate acetabular formation during skeletal maturation, stabilizes the femoral head by deepening the acetabulum, and seals synovial fluid within the hip joint. The normal labrum is most frequently triangular in morphology but demonstrates an increasingly rounded and irregular shape in asymptomatic hips with increasing age.13 The labrum reportedly is absent in 3% of patients.14 There is also a wide range of normal labral signal characteristics, including intermediate signal intensity on T1-, proton density-, and T2-weighted images and, less commonly, high signal intensity on T2-weighted images. Normal labral variants that manifest as high T2-weighted signal in or adjacent to the labrum can be mistaken for a labral tear. 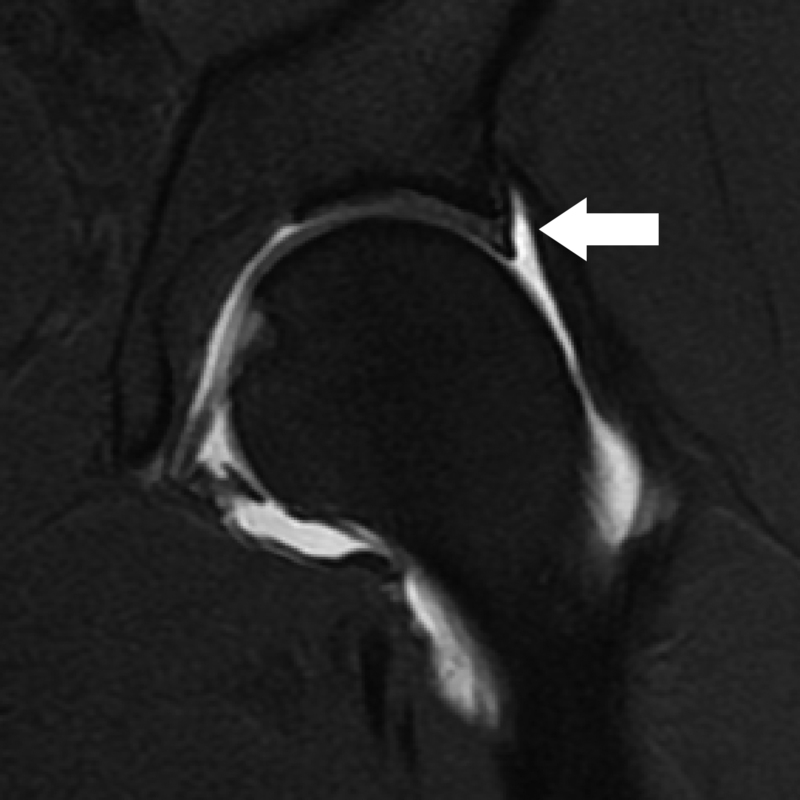 One common variant, the sublabral sulcus, is seen in up to 25% of patients.19 MR imaging characteristics include a linear shape with smooth edges, location at the chondrolabral junction (undermining the labrum rather than extending into it), not full-thickness, and absence of signal changes elsewhere in the labrum (Figure 1). The sublabral sulcus can occur anywhere in the labrum, but it most commonly appears posteroinferiorly (48%) or anterosuperiorly (44%), followed by posterosuperiorly (4%) and anteroinferiorly (4%).19 Several studies have questioned whether sublabral sulci actually represent partial or partially healed labral tears, including one published by Magerkurth et al, who found no sublabral sulci with either MR arthrography or arthroscopy in a small series of patients younger than 17 years old.20 In distinguishing between a labral tear and a sulcus, a labral tear should be suspected if the abnormality is located within the anterosuperior aspect of the labrum, accompanied by appropriate clinical history, and intra-articular anesthetic brings pain relief. A perilabral sulcus or recess is a normal potential space interposed between the labrum and overlying joint capsule. These are most conspicuous in the superior joint space, where the joint capsule inserts several millimeters superior to the labrum (Figure 2), but they can also be seen along the anterior and posterior joint capsule. Perilabral sulci are easy to detect if the joint is distended with a joint effusion or contrast, as is the case in MR arthrography. However, if the joint is not distended, a small volume of trapped fluid in the perilabral recess may mimic a paralabral cyst.21 If the perilabral sulcus is large, it may mimic capsular stripping. 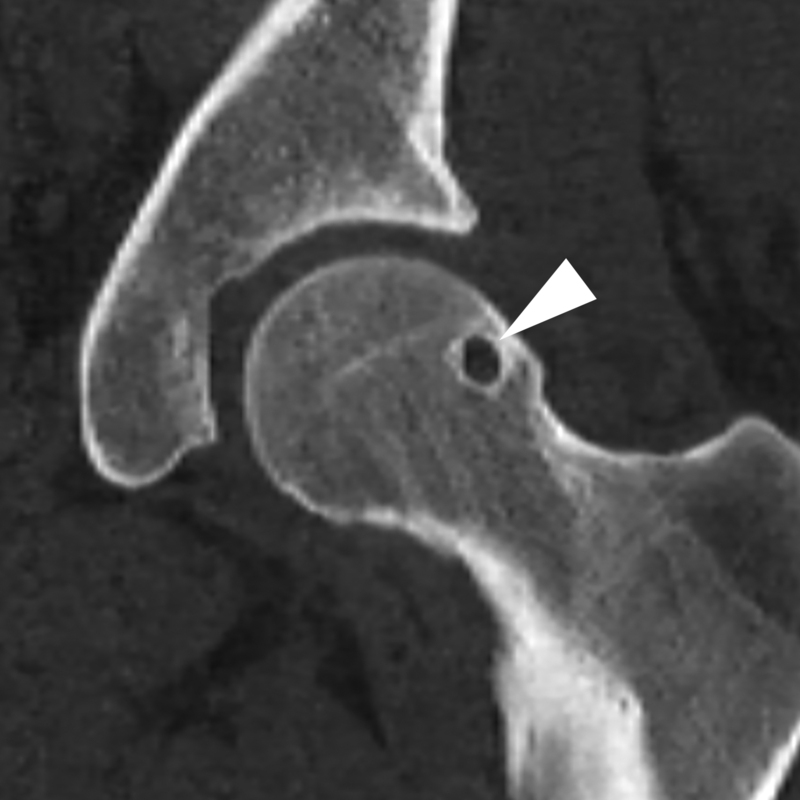 An os acetabuli is a small accessory ossification center located adjacent to the acetabular rim present in 2-3% of the population.22 On radiography, they appear as a well-corticated ossicle adjacent to the acetabulum, most common anterosuperiorly. 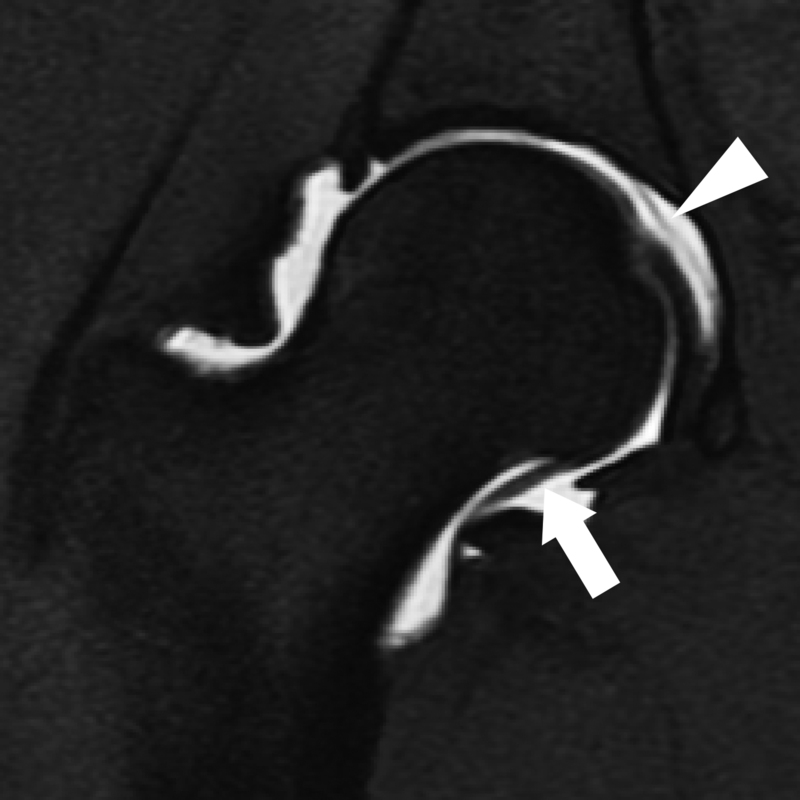 On MRI, these ossicles follow marrow signal intensity and are separated from the acetabulum by a thin cartilage rim (Figure 3). At least one sequence without fat suppression is necessary to discern the typical appearance of marrow within the ossicle and to ensure the ossicle is not confused with a labral tear. When located in the acetabular fossa (os acetabuli centrale), they may mimic an intra-articular body.23 Os acetabuli can also be acquired as sequelae of incompletely healed fractures or ossification of the acetabular labrum. These structures are typically asymptomatic; if large enough, however, they may contribute to symptoms of femoroacetabular impingement. Another variant of the acetabular roof is the stellate crease, which is typically an arthroscopic finding only. While the SAF is a focal defect of bone, the stellate crease is a focal defect of articular cartilage. It is located more medially within the acetabular roof than the SAF, immediately adjacent to the acetabular notch (Figure 5). It is a thin, star-shaped focal bare area devoid of articular cartilage and can be mistaken for a pathologic defect at MRI and arthroscopy. Its characteristic shape, location, clean margins, and lack of associated bone marrow abnormality help distinguish the stellate crease from a true cartilage abnormality.21,24,26,27 In addition, acquired cartilage defects should not be limited to just this location. The iliopsoas bursa is located lateral to the femoral artery and vein and deep to the myotendinous portion of the iliopsoas muscle. It is the largest bursa in the body, measuring up to 3 × 6 cm.32 It is present in most individuals and directly communicates with the hip joint in approximately 15% of cases.32 When distended with fluid or debris, it assumes a characteristic appearance of one or two ovoid or teardrop shaped collections on either side of the iliopsoas tendon (Figure 7). The bursa travels along with the iliopsoas tendon toward the tendon attachment on the lesser trochanter. The bursa can also extend cephalad into the iliac fossa, where it can become quite large. Though iliopsoas bursitis can be a cause of hip pain, it is important to consider communication between the hip joint and iliopsoas bursa, as a distended or debris-filled bursa may reflect intra-articular pathology rather than bursitis.33,34 It is also important not to mistake the bursa for a paralabral cyst, cystic mass, or pelvic lymphadenopathy. It is the authors’ experience that paralabral cysts invariably lie lateral to the iliopsoas tendon, whereas bursitis usually starts medial to the tendon or envelops it from both sides. The obturator externus bursa is a potential space located between the obturator externus tendon and the ischiofemoral capsular ligaments at the posterior aspect of the hip joint capsule. It communicates with the hip joint in all cases, and is considered by some to represent an articular recess rather than a true bursa.35,36 On MRI, the obturator externus bursa can be a site where intra-articular bodies and joint fluid collect. MR arthrography can distend the capsule and fill the bursa with contrast (Figure 8); it should not be mistaken for a rent or partial tear of the joint capsule. Several labral, osteocartilaginous, and soft tissue normal variants exist around the hip joint that may mimic, and must be distinguished from, true pathologic conditions. Awareness of these conditions can prevent unnecessary evaluation or intervention. Additionally, although these entities are typically asymptomatic, some normal variants may herald an underlying process such as abnormal biomechanics, which may predispose the hip to disease. MR arthrography can increase specificity and diagnostic confidence in uncertain cases. Potter HG, Schachar J. 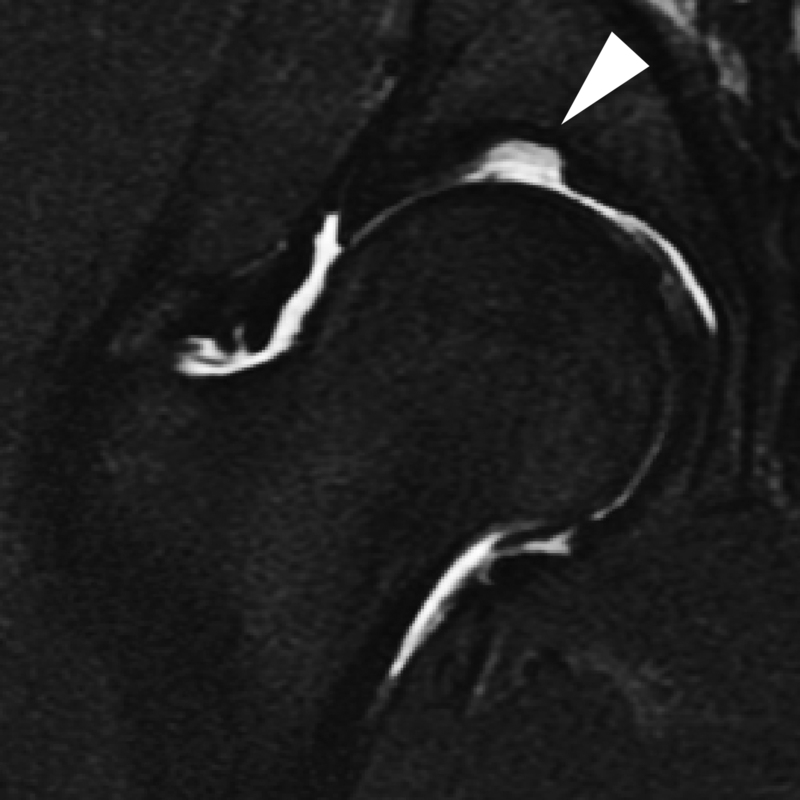 High resolution noncontrast MRI of the hip. J Magn Reson Imaging. 2010;31(2):268-278. Petchprapa CN, Dunham KS, Lattanzi R, et al. Demystifying radial imaging of the hip. Radiographics. 2013;33(3):E97-E112. Zlatkin MB, Pevsner D, Sanders TG, et al. Acetabular labral tears and cartilage lesions of the hip: indirect MR arthrographic correlation with arthroscopy--a preliminary study. AJR Am J Roentgenol. 2010;194(3):709-714. Petchprapa CN, Rybak LD, Dunham KS, et al. Labral and cartilage abnormalities in young patients with hip pain: accuracy of 3-Tesla indirect MR arthrography. Skeletal Radiol. 2015;44(1):97-105. Byrd JW, Jones KS. Diagnostic accuracy of clinical assessment, magnetic resonance imaging, magnetic resonance arthrography, and intra-articular injection in hip arthroscopy patients. Am J Sports Med. 2004;32(7):1668-1674. Smith TO, Hilton G, Toms AP, et al. The diagnostic accuracy of acetabular labral tears using magnetic resonance imaging and magnetic resonance arthrography: a meta-analysis. Eur Radiol. 2011;21(4):863-874. Ziegert AJ, Blankenbaker DG, De Smet AA, et al. Comparison of standard hip MR arthrographic imaging planes and sequences for detection of arthroscopically proven labral tear. AJR Am J Roentgenol. 2009;192(5):1397-1400. Schmid MR, Notzli HP, Zanetti M, et al. 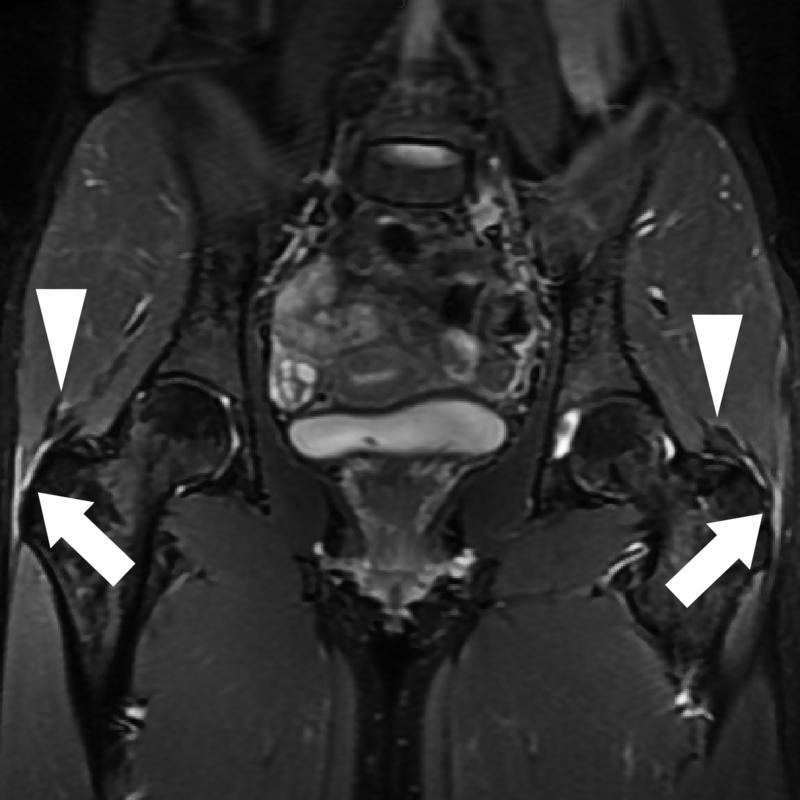 Cartilage lesions in the hip: diagnostic effectiveness of MR arthrography. Radiology. 2003;226(2):382-386. Mintz DN, Hooper T, Connell D, et al. Magnetic resonance imaging of the hip: detection of labral and chondral abnormalities using noncontrast imaging. Arthroscopy. 2005;21(4):385-393. Sutter R, Zubler V, Hoffmann A, et al. 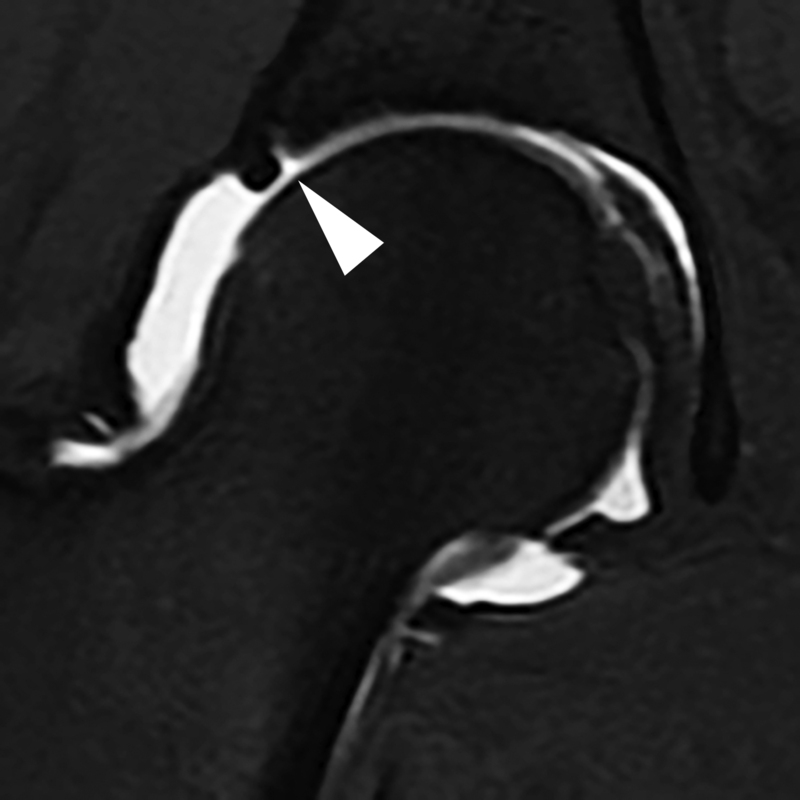 Hip MRI: how useful is intraarticular contrast material for evaluating surgically proven lesions of the labrum and articular cartilage? AJR Am J Roentgenol. 2014;202(1):160-169. Sundberg TP, Toomayan GA, Major NM. Evaluation of the acetabular labrum at 3.0-T MR imaging compared with 1.5-T MR arthrography: preliminary experience. Radiology. 2006;238(2):706-711. Park SY, Park JS, Jin W, et al. Diagnosis of acetabular labral tears: comparison of three-dimensional intermediate-weighted fast spin-echo MR arthrography with two-dimensional MR arthrography at 3.0 T. Acta Radiol. 2013;54(1):75-82. Lecouvet FE, Vande Berg BC, Malghem J, et al. 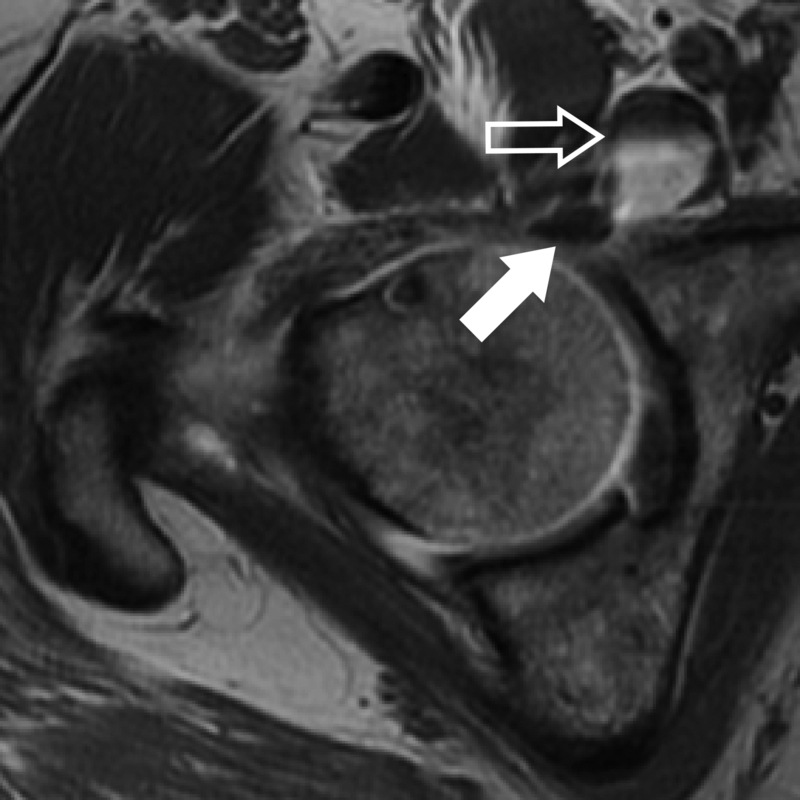 MR imaging of the acetabular labrum: variations in 200 asymptomatic hips. AJR Am J Roentgenol. 1996;167(4):1025-1028. Aydingoz U, Ozturk MH. MR imaging of the acetabular labrum: a comparative study of both hips in 180 asymptomatic volunteers. Eur Radiol. 2001;11(4):567-574. Blankenbaker DG, Tuite MJ. Acetabular labrum. Magn Reson Imaging Clin N Am. 2013 ;21(1):21-33. McCarthy JC, Noble PC, Schuck MR, et al. The Otto E. Aufranc Award: The role of labral lesions to development of early degenerative hip disease. Clin Orthop Relat Res. 2001(393):25-37. Fitzgerald RH, Jr. Acetabular labrum tears. Diagnosis and treatment. Clin Orthop Relat Res. 1995(311):60-68. Lage LA, Patel JV, Villar RN. 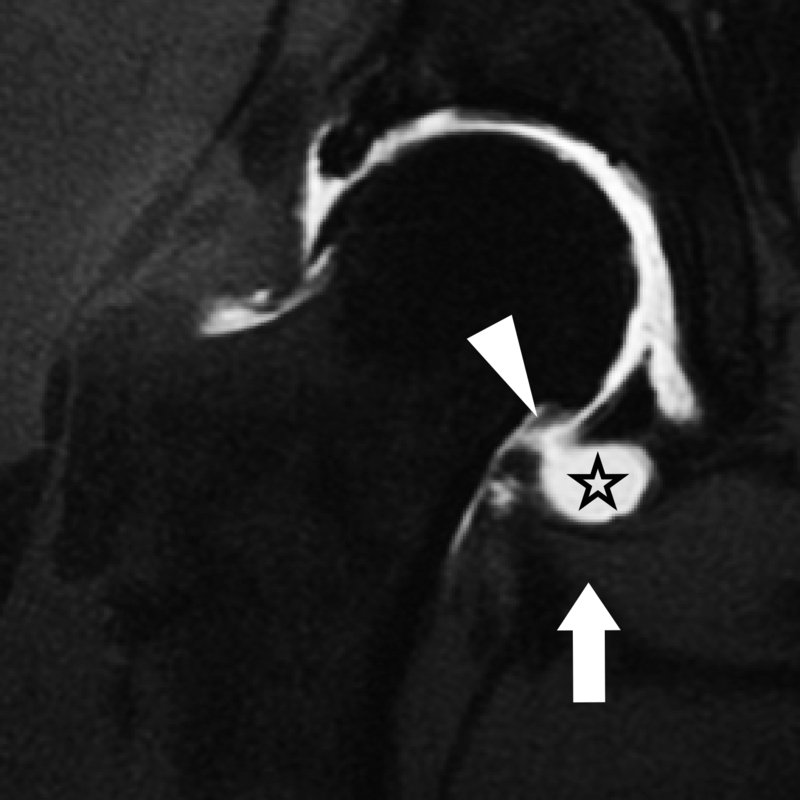 The acetabular labral tear: an arthroscopic classification. Arthroscopy. 1996;12(3):269-272. Saddik D, Troupis J, Tirman P, et al. 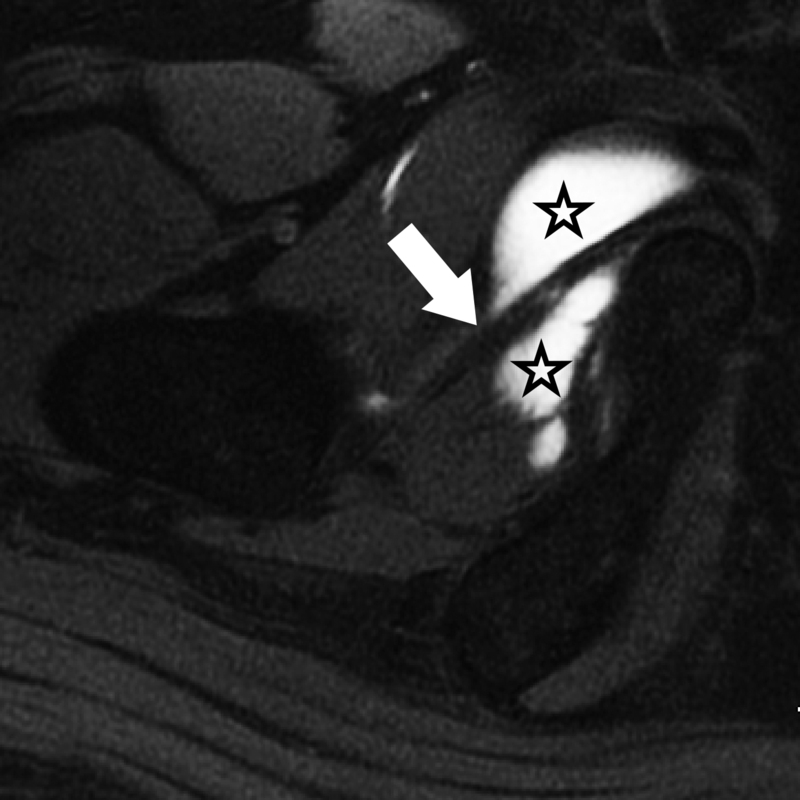 Prevalence and location of acetabular sublabral sulci at hip arthroscopy with retrospective MRI review. AJR Am J Roentgenol. 2006;187(5):W507-511. Magerkurth O, Jacobson JA, Morag Y. Prevalence of the acetabular sublabral sulcus at MR arthrography in patients under 17 years of age: does it exist? Skeletal Radiol. 2015;44(7):953-961. DuBois DF, Omar IM. 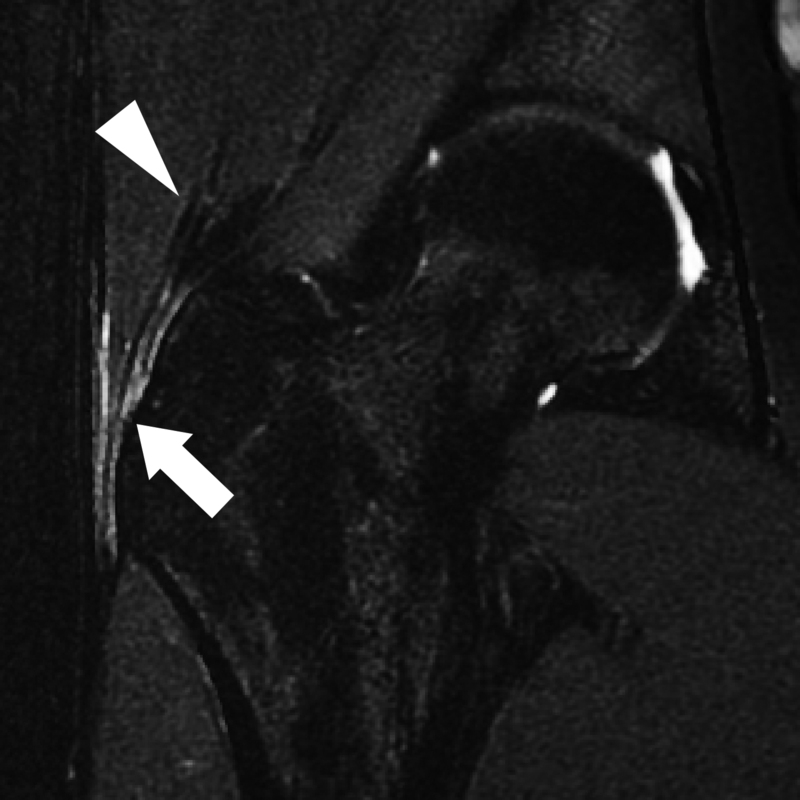 MR imaging of the hip: normal anatomic variants and imaging pitfalls. Magn Reson Imaging Clin N Am. 2010;18(4):663-674. Arho O. Raajojen ylilukuiset hut röntgenkuvissa. [Accessory bones of extremities in roentgen picture.]. Duodecim. 1940(56):399-410. 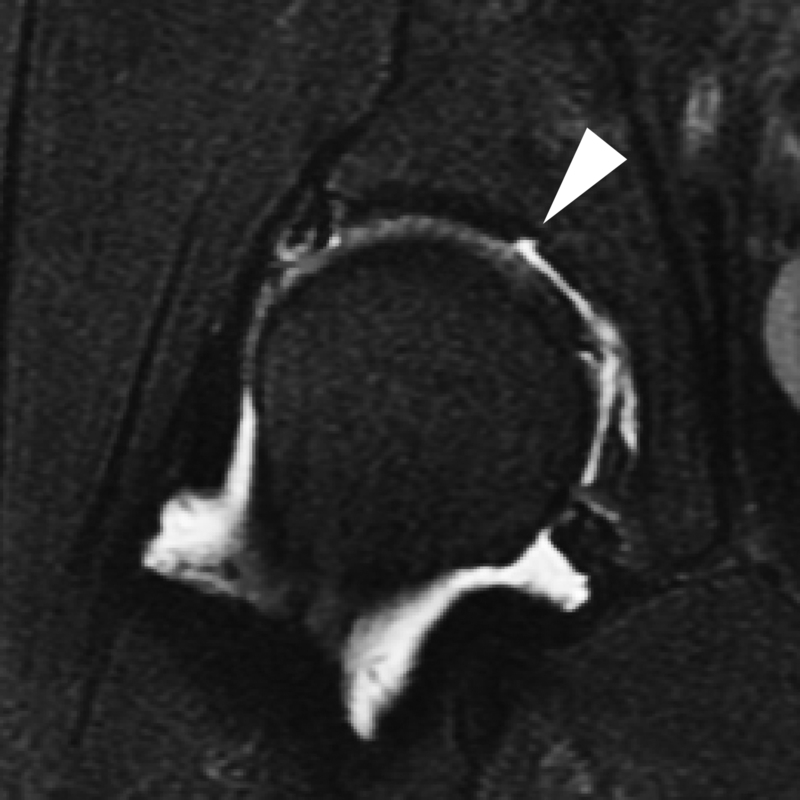 Hergan K, Oser W, Moriggl B. Acetabular ossicles: normal variant or disease entity? Eur Radiol. 2000;10(4):624-628. Dietrich TJ, Suter A, Pfirrmann CW, et al. Supraacetabular fossa (pseudodefect of acetabular cartilage): frequency at MR arthrography and comparison of findings at MR arthrography and arthroscopy. Radiology. 2012;263(2):484-491. Byrd JW. [Hip arthroscopy. Portal technique and arthroscopic anatomy]. Orthopade. 2006;35(1):41-42, 44-50, 52-43. Keene GS, Villar RN. Arthroscopic anatomy of the hip: an in vivo study. Arthroscopy. 1994;10(4):392-399. Nguyen MS, Kheyfits V, Giordano BD, et al. 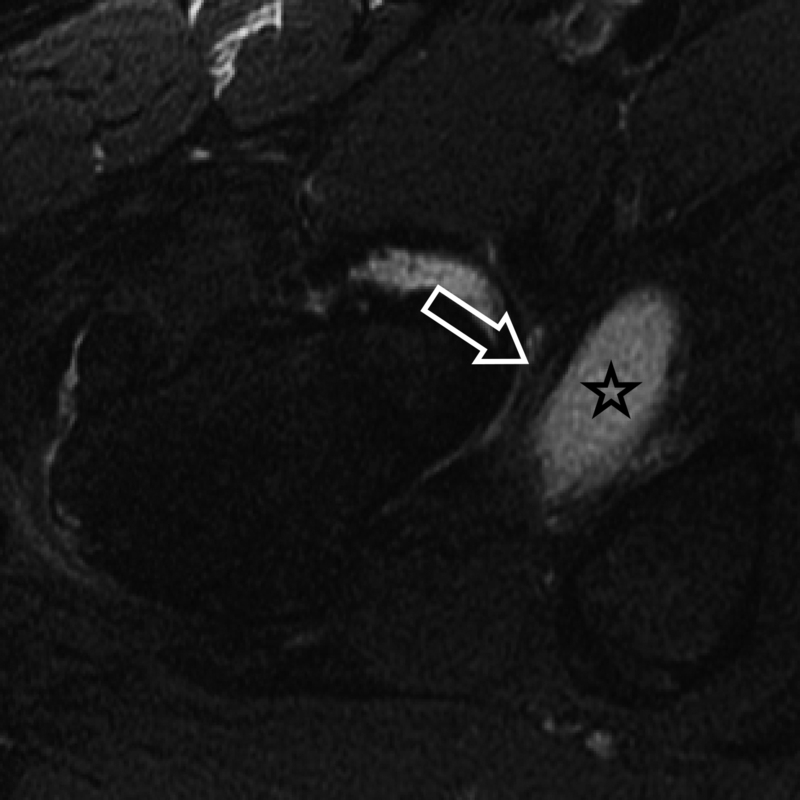 Hip anatomic variants that may mimic pathologic entities on MRI: nonlabral variants. AJR Am J Roentgenol. 2013;201(3):W401-408. Crabbe JP, Martel W, Matthews LS. Rapid growth of femoral herniation pit. AJR Am J Roentgenol. 1992;159(5):1038-1040. Pitt MJ, Graham AR, Shipman JH, et al. Herniation pit of the femoral neck. AJR Am J Roentgenol. 1982;138(6):1115-1121. Leunig M, Beck M, Kalhor M, et al. Fibrocystic changes at anterosuperior femoral neck: prevalence in hips with femoroacetabular impingement. Radiology. 2005;236(1):237-246. Tannast M, Siebenrock KA, Anderson SE. 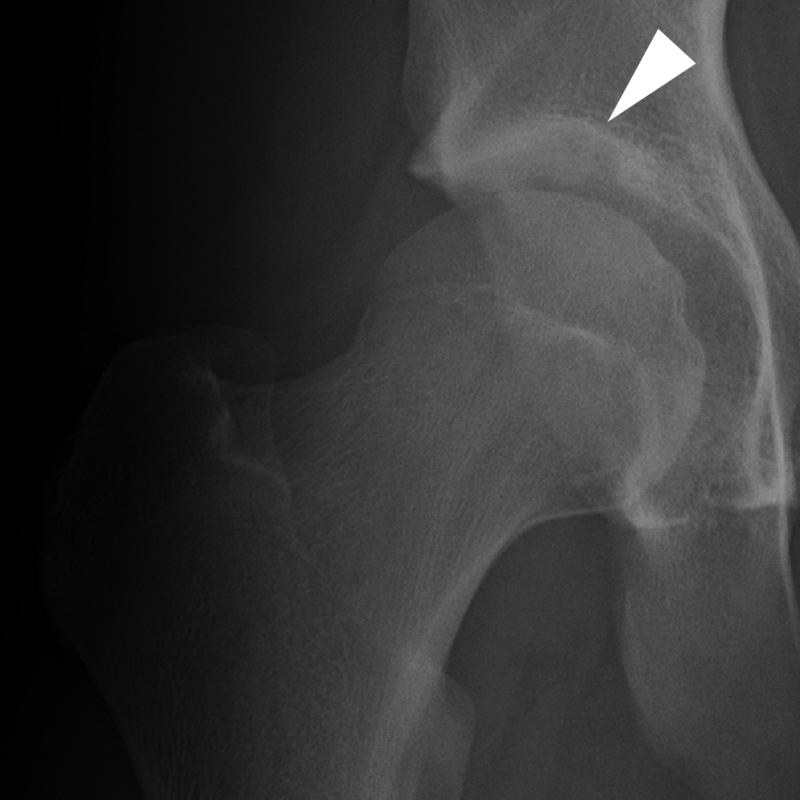 Femoroacetabular impingement: radiographic diagnosis--what the radiologist should know. AJR Am J Roentgenol. 2007;188(6):1540-1552. Varma DG, Richli WR, Charnsangavej C, et al. MR appearance of the distended iliopsoas bursa. AJR Am J Roentgenol. 1991;156(5):1025-1028. Blankenbaker DG, De Smet AA, Keene JS. Sonography of the iliopsoas tendon and injection of the iliopsoas bursa for diagnosis and management of the painful snapping hip. Skeletal Radiol. 2006;35(8):565-571. Blankenbaker DG, Tuite MJ. Iliopsoas musculotendinous unit. Semin Musculoskelet Radiol. 2008;12(1):13-27. Guerra J, Jr., Armbuster TG, Resnick D, et al. The adult hip: an anatomic study. Part II: the soft-tissue landmarks. Radiology. 1978;128(1):11-20. Robinson P, White LM, Agur A, et al. 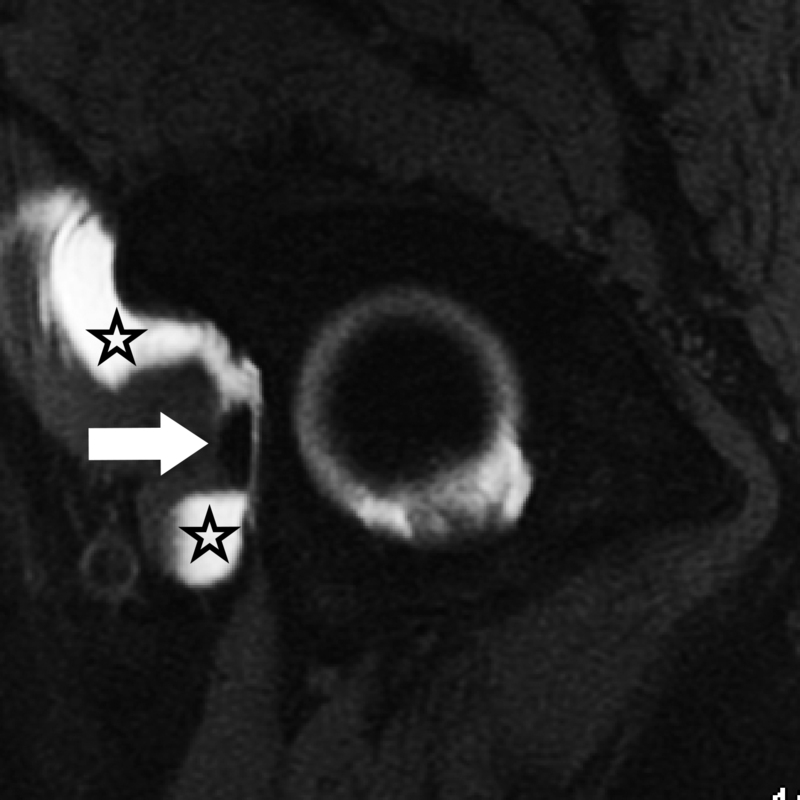 Obturator externus bursa: anatomic origin and MR imaging features of pathologic involvement. Radiology. 2003;228(1):230-234. Blankenbaker DG, Davis KW, De Smet AA, et al. 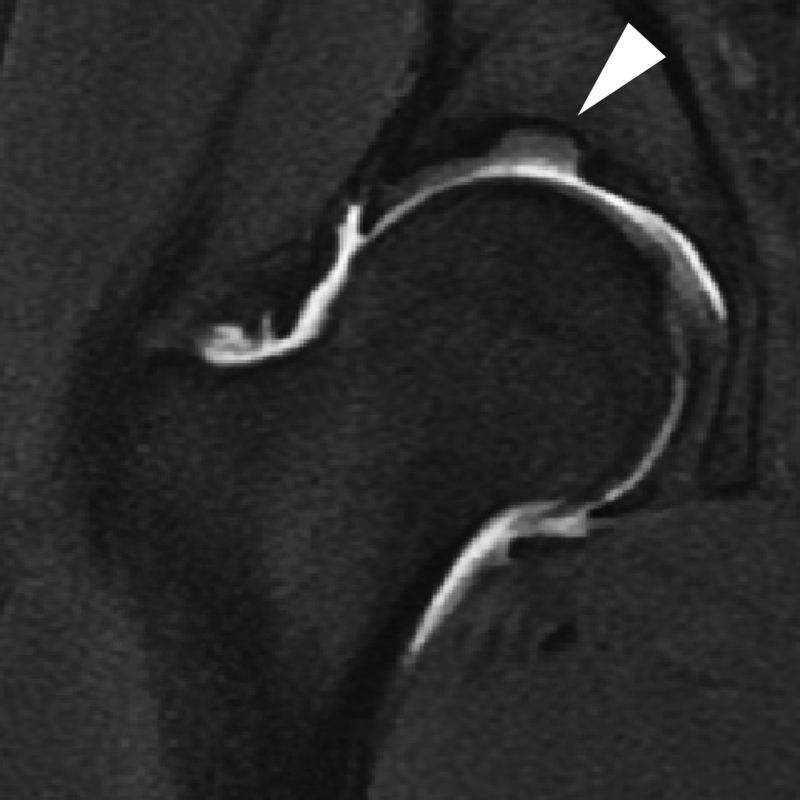 MRI appearance of the pectinofoveal fold. AJR Am J Roentgenol. 2009;192(1):93-95. Blankenbaker DG, Ullrick SR, Davis KW, et al. Correlation of MRI findings with clinical findings of trochanteric pain syndrome. Skeletal Radiol. 2008;37(10):903-909. Haliloglu N, Inceoglu D, Sahin G. Assessment of peritrochanteric high T2 signal depending on the age and gender of the patients. Eur J Radiol. 2010;75(1):64-66. Klontzas ME, Karantanas AH. Greater trochanter pain syndrome: a descriptive MR imaging study. Eur J Radiol. 2014;83(10):1850-1855. Chan BY, Allen H, Davis KW, Blankenbaker DG. 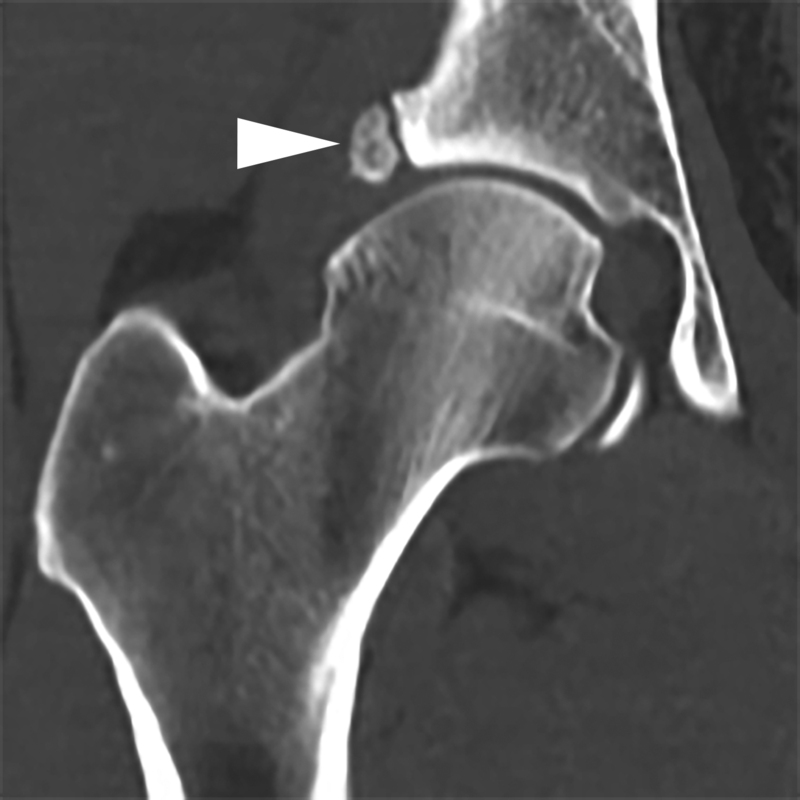 MR Imaging of the hip: Avoiding pitfalls, identifying normal variants. Appl Radiol. 2018;47(12):8-14. Dr. Chan and Dr. Allen are Radiologists at the University of Utah School of Medicine, Salt Lake City, UT; and Dr. Davis and Dr. Blankenbaker are Radiologists at the University of Wisconsin School of Medicine and Public Health, Madison, WI. Dr. Blankenbaker and Dr. Davis are Consultants for and receive royalties from Elsevier.